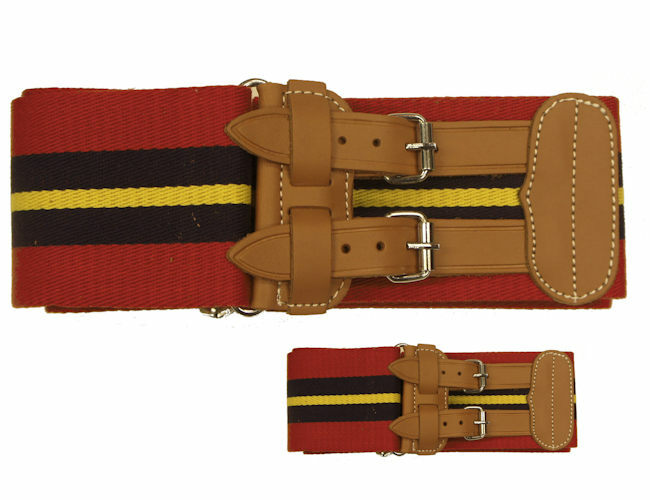 This is a fantastic stable belt in the Regiments colours and has double tan leather straps and nickel buckles according to MOD specifications. The belts comes in 4 sizes up to a size 50 so will fit most people. Made from durable polypropylene weave that is tough and easy to clean.This is a very smart looking belt. Please contact us if you want bulk prices. 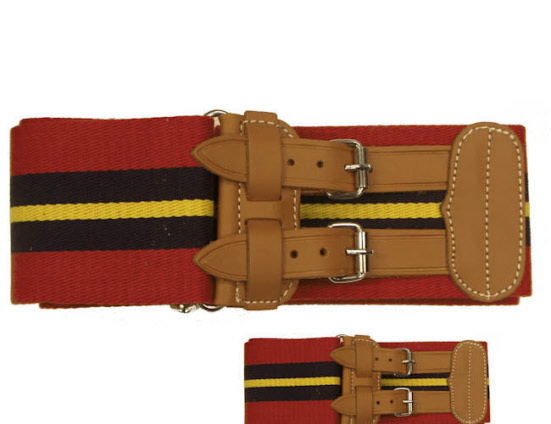 The stable belt became popular with the British Army at the beginning of the 20th century, but was used long before that with cavalry regiments in the stables hence the name.In the 1900's the belt became popular with officers as they had been wearing ties in regiment colours. This led to the increase use of colours and stable belts followed with the colours of the regiments. Foundation Of the Regiment Of Artillery. 1899 was the year the Royal Warrant of the Royal Garrison Artillery came to be as a separate corps, but in 1924 it was joined with the Field Regiments and was known as the Royal Artillery. Today the Royal Artillery is made up of 9 Batteries of the Royal Horse Artillery and 71 other Batteries. They use a variety of weapons such as rocket launchers , howitzers and light guns and Area Air Defense systems and much more advanced weapons systems.